The Parks story ignores how government started the problem that Parks helped to end. 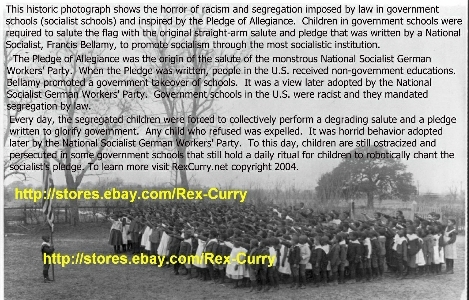 When government began socializing and monopolizing buses, it expanded government-mandated racism. Parks' persecution is another example of government peeing on everyone and then claiming that it was rain. The persecution of Parks on a city-regulated bus is similar to the persecution of Parks' friends and family on government school buses and within government schools. Government forced people to ride segregated buses and to attend the government's segregated schools. Dr. Curry is an attorney and is often asked about important court cases, including that of Rosa Parks. Curry said, "If the government had taken over all churches then the same horror would have resulted, with government-mandated racism in government churches. The libertarian solution would have been to end socialized churches. It is fortunate that the Constitution prevented government churches. It is unfortunate that the Constitution did not prevent government buses, government-created bus monopolies, and government schools, though they are no where authorized." In addition to ending government’s racism, Parks should have ended government involvement in busings. The separation of economy and state is as important as the separation of church and state. http://www.rexcurry.net/schoolsmain.html Its not too late. They boycotted the buses for a year and used other means of transportation. They were not able to simply operate their own buses, because the buses were a government-created monopoly. They were even persecuted by the government for car-pooling on the grounds that it was an unauthorized bus substitute. Another report said that the bus company nearly went bankrupt from the boycott that followed. It is amazing how media stories about segregation never mention that the government was responsible for segregation. Media stories about Rosa Parks never mention that the reason the bus was segregated was because of government - because a law dictated segregation on the private bus. That there were private bus companies at the time that did not segregate. The 1955 case of City of Montgomery v. Rosa Parks involved charges that Parks violated STATE segregation STATUTES by not relinquishing her seat on a Montgomery City bus to a white man. Southern states enacted laws banning black folk from sitting at segregated lunch counters. The federal courts eventually got around to throwing out those laws. To this day the media often show historic photos of blacks at segregated lunch counters (e.g. at W. T. Grants) and the media fails to clarify whether the segregation was a result of government laws. Government, historically and to this day, has been the greatest promoter of racism and other forms of discrimination with anti-libertarian laws (regarding buses, government schools, government universities, the military, anti-miscegenation laws). Yet, when relief is sought, it seems that Government is then used as an excuse to pile on even more government programs, along with controls of private individuals and their lives and businesses. protection clauses of the Fourteenth Amendment? not in itself constitute unlawful discrimination. Fred David Gray served as defense attorney in the celebrated case of City of Montgomery v. Rosa Parks. After graduating from Alabama State University in 1951, you decided to enter law school. Because African-Americans were not admitted to any law school in Alabama at the time, the state helped finance your enrollment at a law school elsewhere, and thus you arrived as a law student at this University. To A few months after your graduation in 1954, you passed both the Ohio and Alabama bar examinations and, determined to change segregation and discrimination, you moved to Alabama to become the only black attorney in Montgomery. The following year, you defended Mrs. Parks against the charge that she violated state segregation statutes by not relinquishing her seat on a Montgomery City bus to a white man. While your defense failed on a technicality, the case mushroomed into a bus boycott for which you also served as counsel. The boycott in turn launched the most visible portion of the civil rights movement, under the leadership of Dr. Martin Luther King and with your legal advice. The media always fail to make any distinction between discrimination by private individuals and discrimination required from private citizens by government, historically and to this day. It seems that the media will never even mention any distinction between discrimination that is compelled by law and discrimination that is private. Journalists who do not make the distinction are unable to make the distinction between statism and freedom. Journalists who do not discern the difference are unable to discern the proper role of government: That government is as wrong to compel discriminatory behavior by people as it is in forbidding discriminatory behavior. That it is never enough to repeal the laws that dictate discrimination, but that new laws, laws that attempt to dictate non-discriminatory behavior upon private citizens have to be piled on top. Mr. Lifson contacted retired employees of the bus company including Mrs. Margaret Cummings, widow of the former bus station manager Charles Homer Cummings. Mrs. Cummings provided a scrapbook of newspaper clippings that her husband had kept during and after the Montgomery bus boycott of 1955-56. National City Lines (which was the parent company of the Montgomery City Bus Lines) had employed a clipping service to clip and save any newspaper articles about the company’s bus service. Charles Cummings had kept the scrapbook of newspaper articles from the 1955-56 Montgomery bus boycott. Next to articles describing the arrest of Rosa Parks, he wrote "#2857" and "Blake/#2857." James Blake was the bus driver who had Rosa Parks arrested. Mr. Cummings’ relatives confirm that he jotted down the bus number because he felt the events were so important. With this information in hand, Mr. Lifson consulted with the Motor Bus Society of Clark, New Jersey, a nonprofit historical organization. Their research into the records of the General Motors Corp. showed that bus Serial Number 1132 was produced in Pontiac, Michigan, in March 1948. It was a TDH-3610 (Transit Diesel Hydraulic Transmission, 36 passenger, Model 10) delivered to the National City Lines (NCL) of Chicago, Illinois. NCL records indicate that the bus was assigned Coach #2857 and sent to Terre Haute, Indiana. In 1954 it was transferred from Terre Haute to Montgomery, Alabama. Thus, we know that bus #2857 was in Montgomery in 1955, that it was informally documented as the Rosa Parks bus at the time, and that employees passed this information on to Mr. Summerford in 1970, who then passed it on to other people. In October 2001, a member of the Museum’s conservation staff personally inspected the bus, ensuring that its markings and identification were original. A certified forensic document examiner employed by the Museum examined the scrapbooks and saw no reason to doubt the authenticity of the notations. At the same time, local civil rights activists initiated a boycott of the Montgomery bus system. In cities across the South, segregated bus companies were daily reminders of the inequities of American society. Since African Americans made up about 75 percent of the riders in Montgomery, the boycott posed a serious economic threat to the company and a social threat to white rule in the city. A group named the Montgomery Improvement Association, composed of local activists and ministers, organized the boycott. As their leader, they chose a young Baptist minister who was new to Montgomery: Martin Luther King, Jr. Sparked by Mrs. Parks’ action, the boycott lasted 381 days, into December 1956 when the U.S. Supreme Court ruled that the segregation law was unconstitutional and the Montgomery buses were integrated. The Montgomery Bus Boycott was the beginning of a revolutionary era of non-violent mass protests in support of civil rights in the United States. It was not just an accident that the civil rights movement began on a city bus. In a famous 1896 case involving a black man on a train, Plessy v. Ferguson, the U.S. Supreme Court enunciated the “separate but equal” rationale for Jim Crow. Of course, facilities and treatment were never equal. Under Jim Crow customs and laws, it was relatively easy to separate the races in every area of life except transportation. Bus and train companies couldn’t afford separate cars and so blacks and whites had to occupy the same space. Thus, transportation was one the most volatile arenas for race relations in the South. Mrs. Parks remembers going to elementary school in Pine Level, Alabama, where buses took white kids to the new school but black kids had to walk to their school. “I'd see the bus pass every day,” she said. “But to me, that was a way of life; we had no choice but to accept what was the custom. The bus was among the first ways I realized there was a black world and a white world” (emphasis added). Civil rights advocates had outlawed Jim Crow in interstate train travel, and blacks in several Southern cities attacked the practice of segregated See the bus specificationsbus systems. There had been a bus boycott in Baton Rouge, Louisiana, in 1953, but black leaders compromised before making real gains. Joann Robinson, a black university professor and activist in Montgomery, had suggested the idea of a bus boycott months before the Parks arrest. In the South, city buses were lightning rods for civil rights activists. It took someone with the courage and character of Rosa Parks to strike with lightning. And it required the commitment of the entire African American community to fan the flames ignited by that lightning into the fires of the civil rights revolution. Attends the first mass meeting of the Montgomery Improvement Association led by Martin Luther King, Jr. The issue of segregated seating had long been a source of resentment in Montgomery's black community. African Americans were forced to pay their fares at the front then reboard the bus at the back. They faced systematic harassment from white drivers, who sometimes pulled away before black passengers could reboard. On the bus, blacks sat behind a mobile barrier dividing the races, and as the bus filled, the barrier was pushed back to make room for white passengers. No black person could sit in the same row as a white, and whites had priority in this middle "no-man's land." Thurgood Marshall’s Libertarian Moment (- it didn't last long) by Myles Kantor a law student at Stetson University. This was published at http://www.lewrockwell.com/kantor/kantor4.html on Sept. 21, 2000.
constitutional order and perpetuated the caste-status of countless black Americans? Marshall’s turning point came during the student sit-ins at segregated restaurants. their stores or lunch counters and refusing to leave when ordered to do so." while convincing a country that justice was served by doing so. and courts, then it was unconstitutional." prejudice in Garner v. Louisiana (1961). public facilities in which the States may not enforce a policy of racial segregation." conduct from the Fourteenth Amendment, then, is vacuous. important role in that erosion. Amalgamated Food Employees Union Local 500 v.
constitutional rights of those who use it." compensation for the property taken." state would compel the beekeeper to permit trespassing. Myles Kantor is a law student at Stetson University. http://rexcurry.net is the first, or one of the first, to use the phrases below, according to searches of the internet and newsgroups. The number on the left is the web search result total, the number on the right is the newsgroup search result total. The searches show how the fault for segregation is not placed upon the government via government mandate, nor even upon "government schools" (for which the misleading term "public schools" is often substituted in the media).